You can lay in bed and watch the sea 20metres away! At night drift off to sleep literally listening to waves. There is a modern kitchen with all cooking necessities. And there is a generous bathroom too. The lounge looks out to sea so you can watch the kids play or watch the action on the distant Manukau bar. Large sunny deck faces the sea and is set up for relaxation. The beach reserve is all that is between the deck and the sea. An iconic Pohutukawha tree rests in front of the bach. The beach is safe and suitable for the youngest kids. Boats can be launched from beach. All tide ramps are nearby. There’s plenty of things to do here right on the doorstep of the Waitakere Heritage Park. We think the views are stunning, framed by the volcanic Waitakere Ranges on one side and the soft majesty of South Head on the other. There is no place like this anywhere this close to The City. Even Disney came to Huia in 2007 and filmed a surf movie there as they thought it resembled Hawaii. How cools that! Our bach has everything you need for a relaxing get-away. Relax by the sea on the deck or take a hike on one of the many walks in the native bush. The famous Hillary Trail (after Sir Edmund Hillary) goes through Huia, so if you are walking it stay at our place for a day or two and soak up the experience. Our electricity is mostly provided by the sun however we also connect to the electricity grid for security of supply. Sorry no parties. No big boats. Foster Bay andamp; the Huia environs are a special place and people generally live and stay there for its peaceful location and environment. Please respect the peace and quiet (but have fun!). The neighbours are good friends of ours and we aim to keep them that way. Their feedback will take precedence over any dispute. Have fun and enjoy yourself - we do. Extras: Cleaning (Required, NZ$50.00 per stay); NOTE: Under Kiwi bach tradition you are expected to: Bring your own linen (towels/sheets/tea towels), unless you are traveling from a long way away....if you are then you may use the bach linen. Parking in the driveway for 4 cars. Electric 4 element stove and oven. I keep a stock of basics available for guest use. There may be some food items in the pantry, please replace what you use. A full kitchen with all the usual items required to cook a home cooked meal. There is 1 double kayak and 1 single. Beach front deck. Also there is an outdoor area outside the front door that is covered so is suitable for use in almost any weather. This is one of my favourite spots! The bach is very spacious, well equipped and full of good vibes. The sea is just one step from the veranda, great sound. Pete is a great host, very helpful and responsive. Thank you! Want to be back definitely. We loved our week here, it was the perfect way to say goodbye to NZ after six months here. 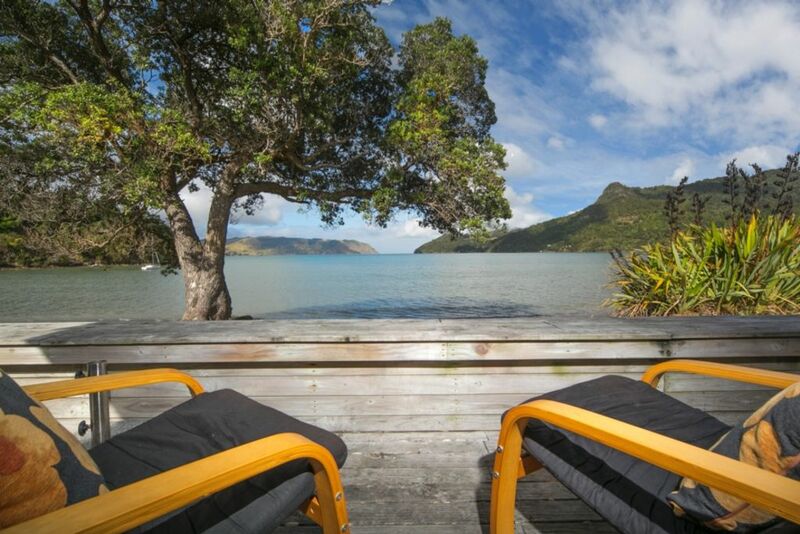 The house is beautifully situated on Huia Bay, it has everything you need to make the most of its location, from a waterfront breakfast to kayaks and even a windsurfer. We had a great time, and felt completely safe kayaking and swimming, which you can do for at least 2 hours either side of high tide without walking. The morning and evening views over the inlet out to the Tasman Sea were breathtaking, and it's ideally situated for exploring the entire Waitakere Ranges region plus the west coast places like Piha and Te Henga. The house itself is well equipped, and the double bed we used was perfectly comfortable for a pair of "bed connoisseurs" like us. It would be fine for a larger family too. Nights were wonderfully quiet with only the silver moon to light the sea. All in all, we loved the place and its location and were really sad to be leaving - both leaving Huia but also leaving such a breathtakingly beautiful country with lovely friendly people. We will be back! Loved being back to basics, views and the sound of the sea were fantastic. Amazing amazing place, a real gem. In front of the sea, unbelievable spot. Peaceful. All we needed inside. Had the best time there, and we'll remember it always. Second stay and will be como g back year after year. Wow! What a fabulous place to stay! This was the most relaxing, scenic, chilled out place we have visited. The soothing sound of the waves to lull you to sleep. A nice protected bay to swim and play in, and the best views going. The Huia Cafe is an added bonus.